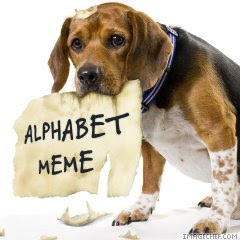 Sandee of Comedy Plus tagged me for the Alphabet Meme. Thanks Sandee. Copy all the links below and replace a single link under the appropriate alphabet. If your domain name, or even the title of your blog, starts with an "A," you'd replace the link under that alphabet and put the replaced link at the bottom. Also, don't forget to credit the tagger, or where you got the list from, at the end of the list with a full URL of the post so that a pingback gets generated. You now have to "tag" at least five people and encourage them to participate so that this thing spreads like a virus. Remember, though, that not everyone's into these kinds of things, so don't be upset if they don't participate. Just simply replace your tag. Remember to tag blogs only and no pornographic ones as we do want to keep the integrity as a blogging community. Bridget @ "...And Miles to Go Before We Sleep..."
Mary, I want to join in, but I don't quite understand Rule No.1. I'll paste this in as you have it and await remediation!